If you grew up watching King Kong then you would appreciate this game from Amaya for sure. But even if you have not seen it we are sure that you will like the game since it has lots to offer. The design of the game is impeccable with all those beautifully designed symbols. The sound effects complement the game in every way possible. King Kong himself is the wild symbol and it appears on the second, third and the fourth reel and it stands in for every other symbol except for the scatter to complete a winning line. 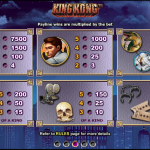 The first feature that we came across was King Kong Smash feature and it is activated with 3 or more scatter symbols. 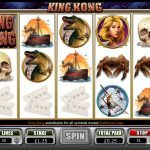 During this feature you need to select planes for King Kong to smash and you can win up to 150 free spins. Before the free spins start you can choose a mystery award instead but you will lose the free spins. The next feature is King Kong Goes Ape which is activated when the wild appears on the third reel. You can get extra wilds during this feature too. King Kong is everything we expected it to be. Amaya Gaming has done an amazing job creating this game and we love everything we see here. The game play is straightforward and smooth and there are a plenty of features available. This is the main reason we play online slots to be honest, because during the features we can improve our balance faster than in the base game. The betting options are wide as well so every kind of a player can find the right bet for them, so it does not matter if it is high roller or low roller. 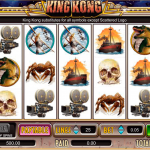 For another game in this great series consider playing King Kong Island Of Skull Mountain a 5 reel slot by Amaya.